It's been a while, but I am pleased to give you the next in the series of Reputation Wars, where we take two big brand names and compare their online reputation. I have changed the format from the last one, which was our comparison of McDonald's and Burger King because this time we're comparing two companies with generally better reputations. Given the recent furore around the collaboration between British Airways and Virgin Atlantic in setting fuel charges I thought these two giants would make a good comparison. ##Scoring a company's online reputation. 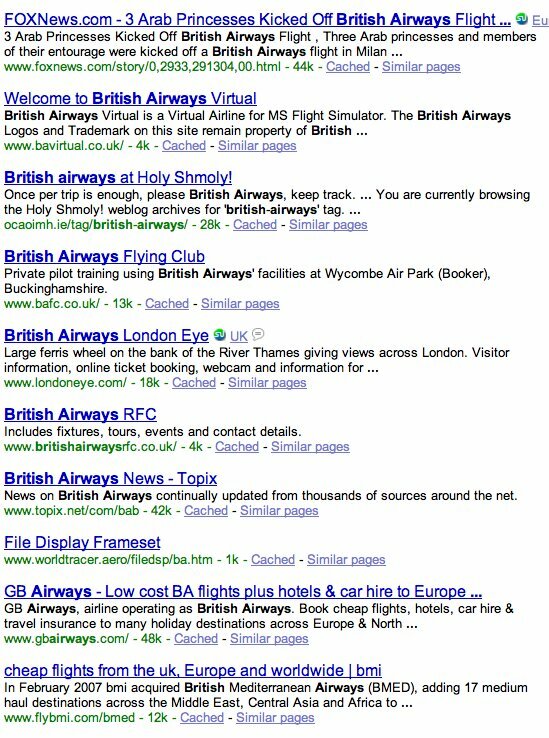 To compare these brands we have looked at the first 20 results for a search for their name. I am comparing the results returned from Google.co.uk (since they are both British companies, and this is where the fine was handed out) and have taken screenshots so you can play along at home. We looked at each of the results and put them into one of three categories. From a reputation perspective we think there are 3 types of results. 1. Those that the company in question owns 2. Those that the company doesn't own but are either positive, neutral or not about the company 3. Those that the company doesn't own but are negative. From a reputation point of view what harms a brand is negative results in the search engines. When deciding whether a result is positive or negative we have used only the title and the snippet shown in the google results. This could mean that when you click through the page is negative but the result doesn't show it that way. From a pure reputation managment point of view, you should obviously care about negative results, but the idea of this analysis is just to look at the first impressions in the search results. As you can see there are a couple of negative results here - but these have been pushed down to the second page. 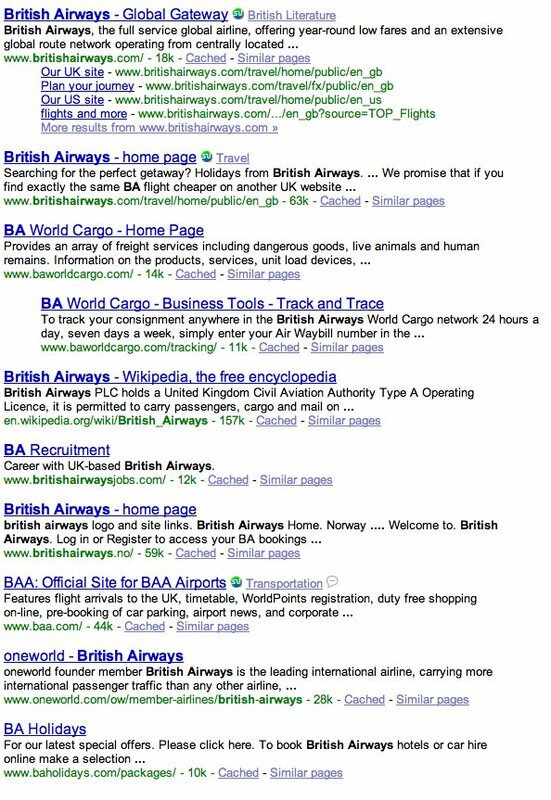 There are a couple of results on the first page that BA doesn't control, but these are either not about them or they are positive. To allow us to compare the two sets of results, we give them a score out of 50. This is based on the type of result (Positive, Negative, Owned) and how high up the results it appears (how influential (to the searcher) it is). British Airways gets a fairly respectable score of 42 / 50. 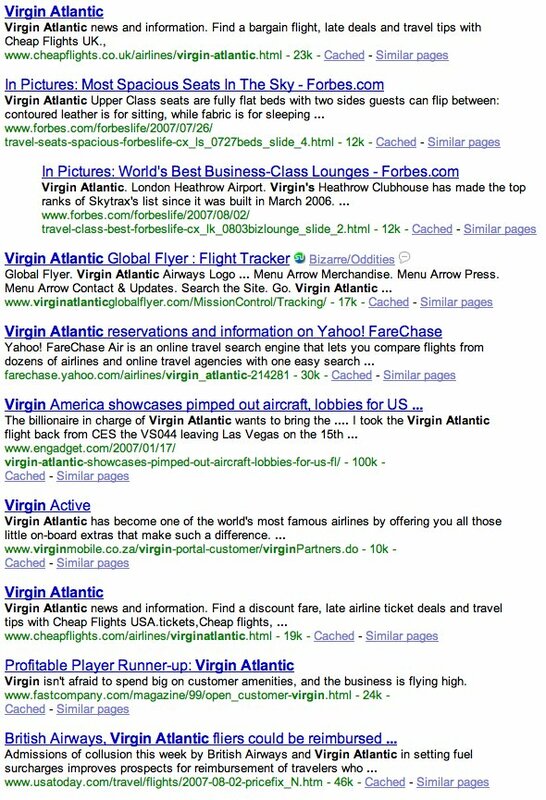 Virgin continue the trend we saw above by owning most of the first page of results. On to the second page there is a slightly different story. 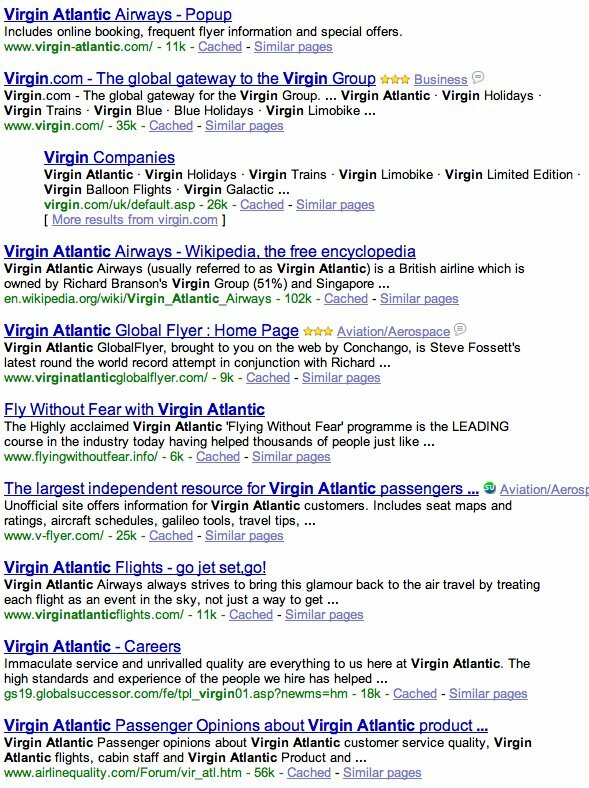 Virgin owns less of the second page results but you have to go all the way to the 20th result before the first negative result is found. To make things a bit more fair, we are also interested in the actual reputation of the companies we are looking at. This is to ensure that a company that has hidden any negative press is still found out. It is interesting to us to find companies with bad reputations that have been covered up with some good reputation management. To give a very rough score for how well a company is liked we compare the number of results for "I love brand name" with "I hate brand name". We converted this ratio into a score out of 50.